If you have questions or if you would like to give us feedback, please contact us by email at info@hear-the-world.com or on the phone +41 58 928 01 01. Full of hope, Ha and Hang are waiting for a special moment: on February 27th, 2019, their son Hung, who is almost three years old, will once again hear his parents’ voices clearly. That is the moment when the boy’s cochlear implant, which he received through the #HearVietnam program on January 21st in Hanoi, will be activated. Hung was born with normal hearing but a progressive hearing loss took that hearing ability away from him when he was about two years old. 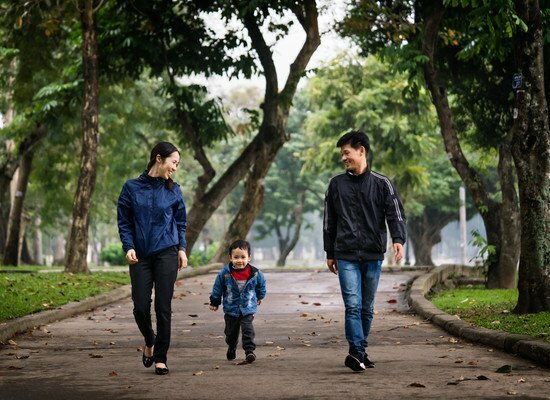 As there is no health insurance or state subsidization for cochlear implants in Vietnam, the Hear the World Foundation is supporting families in need, together with the Global Foundation For Children With Hearing Loss. This is because cochlear implants, the associated surgery, and the lifelong costs of device maintenance are unaffordable for many families. Hang, Hung’s father, tells of the challenges that a low-income family experiences when they have a child with severe hearing loss, and what she and his wife are hoping the surgery will bring for their child. “We have two sons with hearing loss. Until our older son was around three years old, he spoke just like other children. As he grew older, we were surprised to notice him speaking unclearly more and more often, instead of continuing to develop. When we called him, he would often simply not respond. We took him to a doctor, who found out that our first son has progressive hearing loss: in one ear, his hearing loss is severe; in the other ear, our son hears almost nothing. The doctor at the children’s hospital advised us to buy him hearing aids. We did that, and he was also given four years of auditory-verbal training. He actually would have needed implants as well, but they were beyond our means. Nevertheless, our son attends normal school today and we are very proud of him! Our happiness was short-lived though: when our second son, Hung, was born, we had not reckoned with the prospect of him having the same hearing problems as his brother. Hung also developed quite normally at first. At the age of two, he would cheerfully chat away, he loved to sing and he knew many songs. He would also pronounce the names of his grandparents clearly and distinctly. In April 2018, just after turning two, he began to mumble increasingly and responded to sounds less frequently. When we took him to an ENT doctor for an examination in June, we had his hearing tested – but we didn’t think anything could be wrong with his ears. When the doctor told us that Hung has severe to profound progressive hearing loss like his brother, we were shocked and baffled. One child with hearing loss was only just manageable for us. But two at once – it made our world fall apart. The doctor again advised us to buy hearing aids – which we did, even though it pushed us to the limits of our financial means. We didn’t even dare to consider the possibility of a CI. Like his big brother, we registered Hung for auditory-verbal therapy at the children’s hospital. The therapists there are highly dedicated. They knew about the Global Foundation For Children With Hearing Loss and Hear the World Foundation special program that donates cochlear implants for children in need. We applied, desperately hoping for this support. When we learned that Hung had been accepted into the program, we cried tears of joy. For us, it meant that he has a chance to live a normal life. We hope that, after the operation and the activation, he will once again be able to hear his family’s voices: ours, his parents’, his grandparents’, his uncles’ and his aunts’ voices – and that he will answer when we call him. We hope that he learns to pronounce our names clearly again. And we hope that he will connect more with our family again, as well as with children of his age. At the moment, he simply can’t do that. The family supports him wherever possible, so that he will learn to speak properly and become more confident. Hearing the birds singing is something that I love so much. That’s why I’m longing for the moment when my son and I can both listen to the birds chirping, together. Hung also loves the birds. He often plays with animals and calls out to them. When he was smaller, he could pronounce the word ‘bird’ coherently, but after turning two, his speech was already so unclear that it was barely comprehensible anymore. who have been trained by the Global Foundation For Children With Hearing Loss over the past several years in Vietnam. This means the families will have the essential components they require for their children to benefit fully from a cochlear implant. They will be able to hear optimally, learn to speak, go to school – and lead a life without limitations. ein beeindruckender Artikel. Ich habe von 1989 bis 2008 das weltweit erste Rehabilitationszentrum für CI - versorgte Kinder geleitet und auch das erste Reha -Konzept für diese Kinder entwickelt. Das Zentrum wurde durch Herrn Prof. Lehnhardt damals initiiert. Ich habe über 50 Jahre Erfahrung in der pädagogischen Arbeit mit gehörlosen Kindern und davon allein 30 Jahre mit CI-versorgten Kindern. Daher kann ich sehr gut den Nutzen des Cochlear Implants für diesen Jungen einschätzen. Aufgrund seiner früheren Hörerfahrungen und durch eine gute postoperative Hör- Spracherwerbstherapie unter der Führung von Spezialisten aber besonders durch die Eltern, wird er sehr schnell wieder Sprache verstehen und kann diese mit Hilfe CI weiter ausbauen.Wichtig dabei ist ein responsives Sprachverhalten insbesondere der Eltern und der Pädagogen bei allen Aktivitäten des Jungen sowie eine gute und kontinuierliche Anpassung des Sprachprozessors. Z.Zt. engagiere ich mich in Georgien und sehe, dass auch dort viele hörgeschädigte Kinder für ihren Lautspracherwerb vom Cochlear Implant sowie von einer guten Reha profitieren. Ich wünsche weiterhin viel Erfolg. Vielen Dank für Ihren Kommentar und Ihre ermutigenden Worte. Wir achten bei all unseren Projekten auf die Nachhaltigkeit – die langjährige Nachversorgung ist uns ebenso wichtig wie die Spende des Hörgeräts oder Cochlea Implantats. Es freut uns, das von einem Spezialisten wie Ihnen bestätigt zu bekommen.